StepUp is an innovative powered Stairclimber trolley, entirely made of stainless steel, using the energy produced by a professional battery-powered screwdriver for its operation! The trolley and the screwdriver can also be used as separate tools. It is also possible to purchase StepUp without the powered screwdriver. The StepUp trolley is not only very competitive as to the purchase price and maintenance costs; it is also compliant with CE regulations, and extremely safe, thanks to a design that paid great attention to every detail. 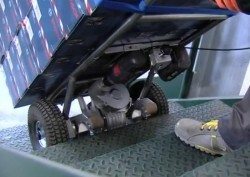 Please have a look at the details of the StepUp Stairclimber trolley in this video. You will immediately perceive the high quality in its construction. StepUp is a unique product in allowing such a high flexibility. It’s not just for climbing stairs! StepUp is a Stairclimber trolley featuring a new conception; it uses the energy produced by a professional battery-powered screwdriver in order to achieve excellent performance: a carrying capacity of 180 kilograms, safety in driving, and no shocks, either going up or down. The rotating handles and compact design grant a manoeuvrability that is hard to find in the Stairclimber trolleys currently available in the market. StepUp can deliver top performance, and its capacity varies depending upon the type of screwdriver used. The maximum and safe load that is recommended and for which the trolley is certified is 180 Kgs. 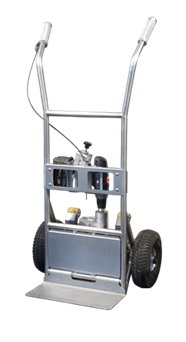 It is worth remarking, however, that thanks to tests carried out by users already experienced with this special Stairclimber trolley, the performance and the whole mechanical frame suffered no drawbacks at all while carrying loads up to 250 Kgs! The StepUp trolley is entirely made in Italy and it complies with the strictest regulations. If you love attention to detail and high-quality products in general, those born and built for the needs of the workers, the StepUp electric Stairclimber trolley will be able to win you over, too! All of these are excellent advantages that will optimize your work and guarantee a durable investment for you. The lifting power of the stairclimber trolley varies depending upon the type of professional battery-powered screwdriver used. Speed is directly controlled by the operator, by means of the control lever under the right handle and linked by a cable to the screwdriver trigger (the faster speed is suggested for lighter loads and the slower one for the heavier ones). 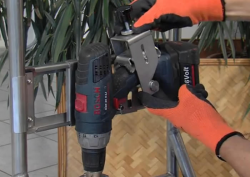 The installation of the screwdriver is simple and it takes just a few minutes. 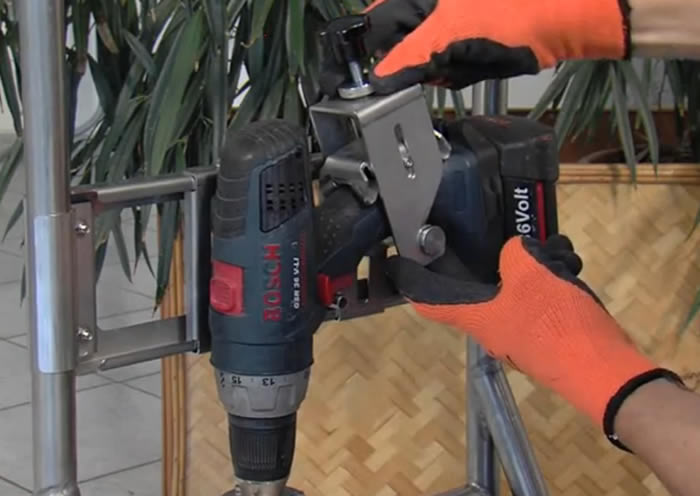 StepUp can also be used as a hand trolley, once the screwdriver is removed. The trolley is entirely made of stainless steel, perfectly finished, and light (30 Kgs without the screwdriver). 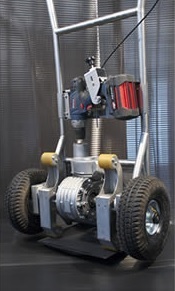 It is equipped with two wheels, lifting cranks, and a folding platform. It can be easily stowed away in a van, taking up little space. Narrow or winding staircases, or with overhanging treads, steep and awkward ramps, landings, corridors, cramped spaces and difficulties in manoeuvring. The electric stairclimber trolley StepUp is the winning response for all professionals who have to lift heavy loads every day, even where the room available does not allow great freedom of movement. 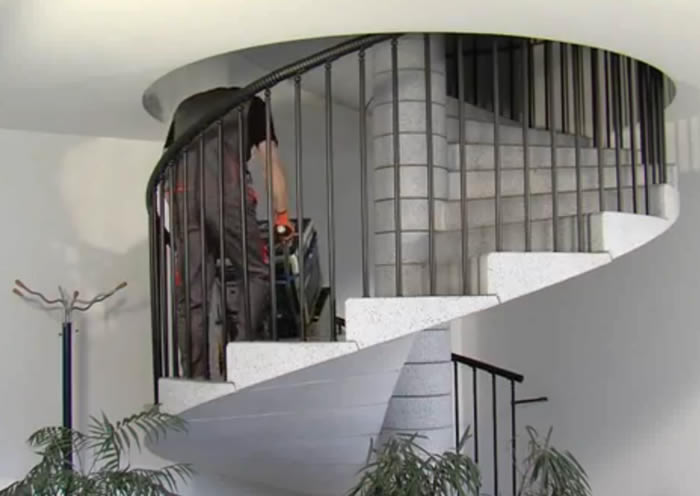 Going up or down the stairs will no longer be a problem, even with heavy or cumbersome loads, thanks to StepUp! 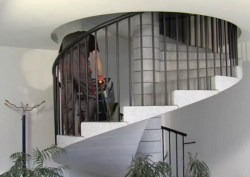 The videos you can see here clearly show the huge potential of this stairclimber trolley.